Toronto Inspires when 70+ voices collectively croon. Post by Lynda Chubak, a newbie to the community choir scene. 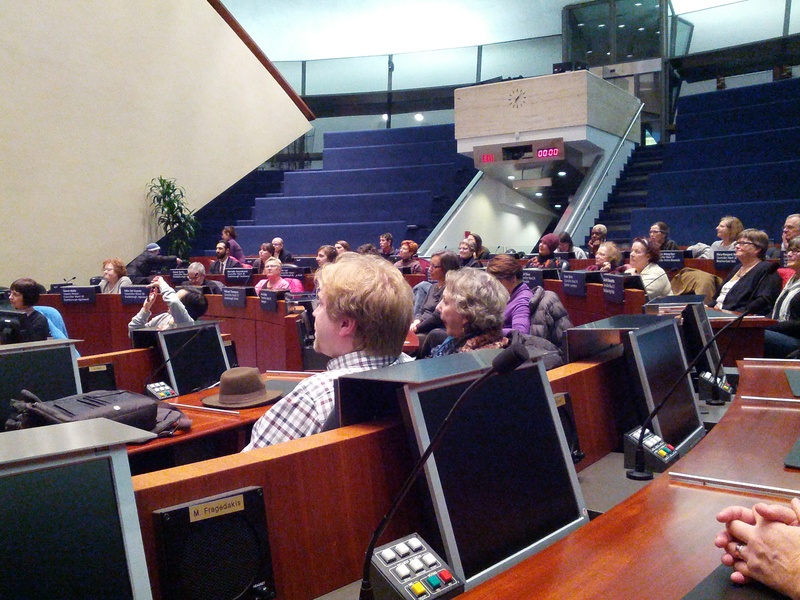 As November at City Hall has been anything but harmonious, the fourth installment of Nightswimming Theatre’s five-part interactive new work brought welcome amicability to Council Chamber. This “pop-up” choir experience shared by more than seventy singing enthusiasts, and led by Dora Award winning music director Reza Jacobs and roots/jazz inspired vocalist Jani Lauzon, explored the political aspect of Why We Are Here! through singing and sound. Entering the restricted area normally reserved for Council Members feels rather surreptitious, as if we’re infringing on a distant colleague’s personal space. We scout out seats by looking at name plates at the stations assigned to councillors. Some choose a spot that aligns with their political affiliations. Others are more intent on expropriation. The Mayor’s end-aisle lounger immediately gets scooped up. While waiting, we goof around: swiveling in our leather chairs, testing out the Yes/No voting buttons.